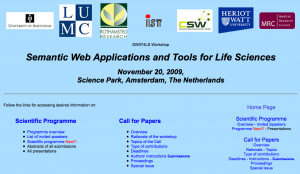 The 2009 edition of SWAT4LS was held in Amsterdam on November 20th 2009 and was organized as a one day workshop. The full program of the 2009 edition is available on the workshop original website. The preliminary program of SWAT4HCLS 2018 is out!